Friedrich der Friedfertige Elector of the Palatinate (1425-1476) married morganatically. His son Ludwig (1463-1524) received the County of Löwenstein. His grandson Ludwig III Count of Löwenstein (1530-1611) married Anna Countess zu Stolberg-Köngistein, heiress of the county of Wertheim. Theirs sons Christoph Ludwig and Johann Dietrich are the ancestors of the two branches of the family. Johann Dietrich Count zu Löwenstein-Wertheim (1585-1644) married Josine de La Marck, heiress of Rochefort. His grandson Maximilian Karl Albert Count zu Löwenstein-Wertheim-Rochefort (1656-1718) was created a Reichsfürst on 3-4-1711. The family lost its possessions on the left bank of the Rhine because of the French annexation and was compensated in 1803 with eclesiastical properties. These were mediatised in 1806. 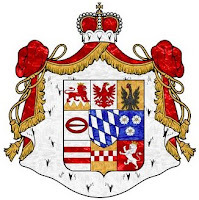 The family took the surname Löwenstein-Wertheim-Rosenberg in 1813. The eldest confirmed ancestor of the Wittelsbach dynasty is an Otto mentioned in 1073 as comes de Skyrun (Count of Scheyern). He is possibly a descendant of Luitpold (+ 907), who was created Markgraf in Karantania and Upper Pannonia in 893 and who acquired possessions around Regensburg. 118. Aloys Joseph Vorst von und zu Liechtenstein * Wenen 26-5-1796 + Eisgrub 12-11-1858; Zn van Johann I Vorst von und zu L. en Josepha Landgravin zu Fürstenberg-Weitra = 66. 119. Franziska de Paula Gräfin Kinsky v. Wchnitz u. Tettau * Wenen 8-8-1813 + Wenen 5-2-1881; Dr van Franz Graf K. v. W. u. T. en Theresia Gräfin v. Wrbna u. Freudent¬hal = 67.